In addition to the most complete inventory on Montreal’s north shore, CDM has become a great place to meet and share photo ideas. Opinions and advice, along with tips and tricks, travel back and forth over the counter between enthusiasts and our knowledgeable staff. It’s also a great place to look over the newest DSLRs, lenses and accessories, and to get a closer look at various options for framing, laminating and mounting photographs in a great variety of textures and finishes. It’s great to get out and shoot photos with a passion, but most enthusiasts enjoy talking about their passion just about as much as taking pictures. Photo CDM is a great place for conversations, and has built its reputation on friendly, professional and personalized service. Photography can sometimes look like a steep mountain to climb. The friendly staff at Photo CDM can guide you all the way, from your first adventures to your own personal summit. All at your own pace, according to your own tastes, and within your chosen budget. From beginners to advanced professional photographers, Photo CDM can help you choose the right camera, the right accessories, and the right post-processing to show off your images. Photography is easier and more fun than ever, thanks to smartphones that allow pictures to be taken at a moment’s notice. But many people want to go that extra step to making their own «keepers», images that are special, and that they’ll be glad to cherish over time. If you’re ready to take the next step into photography, the journey starts at Photo CDM. 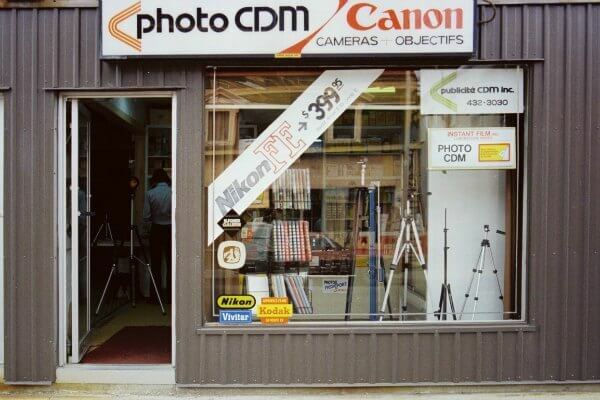 When Jean Lafontaine started Photo CDM in 1979, his modest storefront was a welcome arrival. A few chain stores stocked one or sometimes two models of advanced cameras, but most photo enthusiasts were used to making the trip to downtown Montreal to find a selection of camera bodies, lenses and accessories. Specific film types were at a minimum, and the choice of darkroom chemicals was limited. With his usual sense of precision and attention to detail, Jean Lafontaine and his new store quickly build a trustful following. Working with a few stores and suppliers, CDM soon became a pivot between Monttreal’s best camera shops and enthusiasts in the Laurentians. As photographers rely more and more on the store, orders become larger, and more frequent. Soon Jean is driving on and out of the city 3 times a week. And Photo CDM is born, soon to become the north shore’s fastest-growing camera store. As the small store grows steadily, Jean Lafontaine and his father become principal shareholders, taking over from partners Michel Groleau and Réjean Beaulieu, who had helped pioneer the business. Photo CDM is in tune with photo trends of the time. Film development at the time was still a chemical process. As more and more local stores offer in-house film processing and overnight service, Photo CDM opens its first minilab offering high quality negative processing and printing. Digital photography is the growing trend in 1996. Photo CDM sets out on an ambitious mission, to become a leader in the newest photo technology. As digital photography grows and improves, Photo CDM is one setp ahead of the curve all the way. In 2000, the region’s first all-digital minilab is in operation and by 2001, Photo CDM doubles the area of the store. 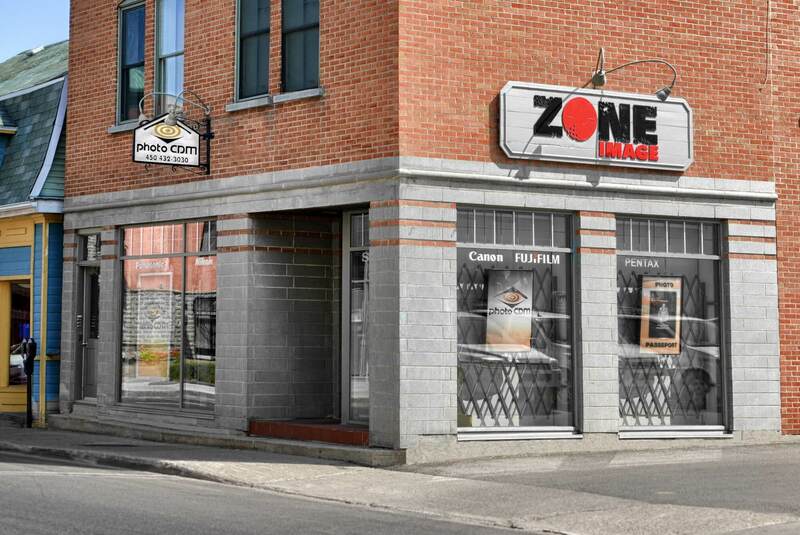 The year 2001 also marks the birth of Zone Image, a group of independent photo retailers. Photo CDM is one of the group’s first two stores. No real surprise because Jean Lafontaine and a few colleagues had been working at setting up Zome Image since 1997. Samuel Lafontaine, Jean’s son, is now co-owner of the store and is dedicated to maintaining and enriching the tradition. Photo CDM has earned awards along the way such as Zone Image Merchant of the Year and nomination for the Distinction Award from Banque Nationale, but the most important prize is awarded daily, by every customer who walks into the store. «Whenever anybody walks in and says This is my camera shop! I am both grateful and very proud», says Jean Lafontaine. After all, Photo CDM, born out of a youthful passion for photography, has been his whole life.